Dashboards for Excel… it’s finally finished! It’s finally done! That’s right: the entire manuscript is done and in production. It’s going to the printers soon. My publisher hasn’t yet updated the Amazon page, but the planned release date is September 15th! 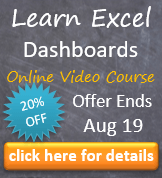 Now, as you might recall, we spun out eight chapters from Dashboards to become Advanced Excel Essentials. So if you already own Essentials, think of Dashboards as the expanded second edition. Where Essentials was about 200 some pages; Dashboards is about 550! So, as you might imagine, there’s considerably more in Dashboards. 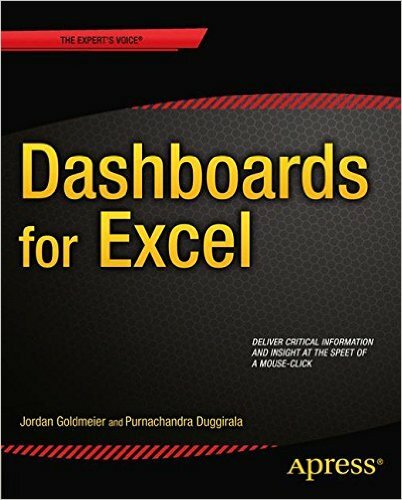 If you’re on the fence about which to order, Dashboards for Excel is going to give you more bang for the buck given Amazon’s current pricing (which might change). Order your copy today! Thanks to the venerable Chandoo who contributed the chapters on Power BI tools. And thanks to everyone for being so supportive. This entry was posted in Tips on September 2, 2015 by Jordan G.
Congratulations Jordan. Looking forward to reading it. Thanks for your patience, my old friend. It’s certainly been a journey since we first spoke about it so many years ago. please, no worries. I only wrote one book in my life, but I can imagine how much effort it is. I loved reading Excel Essentials (and many thanks for the link to my blog in the introduction) and I am truly looking forward to “Dashboards for Excel”. All the best for your new book!